What did you bring back from your summer road trip? A tan? Some mementoes? Photographs? These were planned souvenirs. What about the unplanned ones? I’m sure your car became home to many random items. And your car can store smells. Are they overpowering yet? Perhaps you’re already used to them after hours in the car. But they can’t stay. You’ll never be able to sell your car. Smells can even signal rot or mildew. I know you’re already dreading the cleaning process. Cars are notorious for being hard to deep clean. But that’s because you’re doing it wrong. Take a deep breath and try again. These tips will help you get it right. If car cleaning and deodorizing is a regular necessity you need to invest in some tools. They’ll save you time so they’re worth the expense. High pressure cleaner: Spare yourself some effort. Push grime from exterior crevices instead of doing it by hand. Vacuum cleaner: A hand vacuum cleaner it’s even better. It’s easier to manoeuvre into hard to reach places. Microfiber towels: After a trip you have to put shine into your car again. Microfiber towels help for the exterior as well as some plastic and upholstered areas inside. Make sure you have many rags on hand. You’ll use them to clean the inside and outside of the car. Use a clean one for each new task. Don’t spread grime from one area to another. Everything in your car absorbs odors. 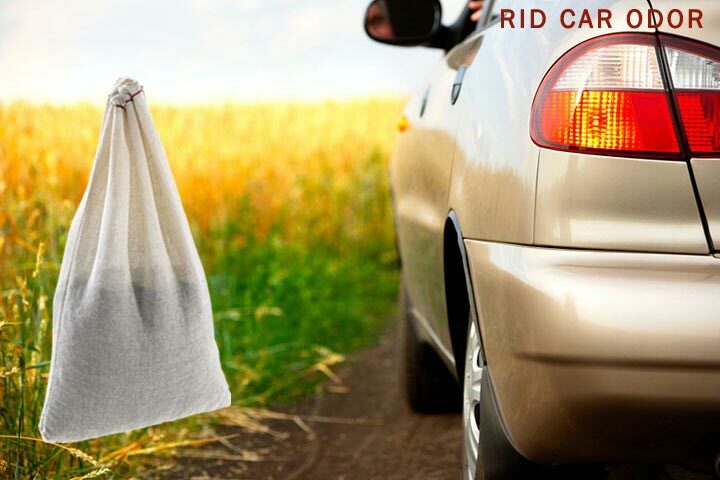 Your first step is to rid your car of garbage and clutter. Now you have less smelly items to contend with. A basic deep cleaning must include these steps. Some people are afraid to wash car seats with water. There’s no other way to clean them and you’re worried for no reason. Do it by hand or hire a machine. A machine will extract all excess water. Make sure your car has ventilation for a few days so you know damp can’t settle in. Gum and other sticky messes no longer concern me. I keep an eraser in my car. Rubbing the area with the eraser eventually lifts the gum from upholstery or carpets. As long as you’re gentle it won’t damage your car’s interior. Don’t leave any grime unattended. You never know where the auto smells come from. The rough surface of vinyl can trap grime easily. Scrub all surfaces with a small brush. Replace the bad odors with aromas you love. You can polish some leather items with olive oil. This is affordable too. Olive oil has a relatively strong smell which may overpower unwanted ones. I have courage to wax my car. I know what the outcome will be. But when it comes to auto odors I’m often daunted. What will really take care of unwanted vehicle smells? Some of them penetrate upholstery and seem to never leave. Here are some tips I find handy. Make sure you don’t walk around with your pets’ smells clinging to you. Remove all physical evidence of them first. Add Odoreze Natural Odor Eliminator to the water to counter the pet odors. Smoke smells can come from cigarettes or campfires. Both can be overpowering. Yes you can fix this problem. Wash upholstery with Odoreze and cold water. Let the upholstery air dry. Don’t use warm water. The heat may cause the unwanted smells to set in. Sprinkle Smelleze powder on upholstery. Leave it for an hour before vacuuming the car. Also, leave a Smelleze pouch in the car to absorb smoke and other unwanted odors. Your car can be clean while auto odors still linger. Focusing on specific problems will remove the source of the nasty car odors. You must treat symptoms and causes. You won’t smell the effect of cleaning for ever. What do you do when their power wears out? The odors in your car must be continually removed as they outgas. This usually takes time. As the bad smells become less powerful your car will smell better. Here’s what you do. Your best weapon will cost you nothing. Leave your car doors open for long periods. Do it during weekends if you can’t leave windows open while you’re parked at the office. The fresh air will circulate through your car and all items inside. Eventually your car’s smell will return to normal. This is why the deodorizer market is so lucrative. No car should be without one. Use a real odor eliminator like Smelleze that removes bad car smells without masking them. Rejuvenate them frequently and reuse so they continually refresh your vehicle. Your car’s air filter picks up a lot of particles while you drive. Make sure they’re not the source of bad odors. The best option is to change this car filter after your summer holiday. You will get used to almost any car smell. You may hate it now but in a few weeks your senses will be accustomed to it. I pity anyone new who enters your car. You’ll think everything is fine while they crave fresh air. You need honest friends for this problem. Ask a friend—who won’t judge you—to smell your car’s interior from time to time. He or she can tell you whether the bad smells are gone. If not, you need to revisit some of these tips. Yes your car’s interior can be saved. Most nasty car odors will disappear if you use the right tools. Do it sooner rather than later. Car smells can set in. The longer you wait the harder your task will be. Learn from this past summer holiday. How can you protect your interior for less damage and auto odors during your next road trip? How do Various Air Purifiers Compare?